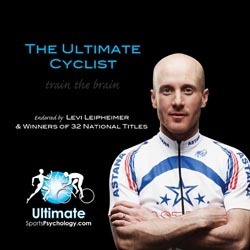 Current U.S. National Road Race Champion Levi Leipheimer has signed on to endorse The Ultimate Cyclist CD. Created by cycling coach and category 1 bike racer Josh Horowitz, and renowned Australian clinical hypnotherapist, Dr. Rick Collingwood, The Ultimate Cyclist is the only cycling-specific sports psychology tool on the market. Since Leipheimer began using the product in 2007, he has twice won the Tour of California and finished third in the Tour De France. Most recently, Leipheimer took bronze in the Beijing Olympic Time Trial. Leipheimer joins National Championship winners Chris Baldwin, Hayden Godfrey, Coryn Rivera and Chad Hartley in endorsing the CD. The CD works through three levels. First, guided visualization calms the body and mind. Next, patented theta rhythm technology induces a deep state of relaxation. Finally, positive suggestions, above and below conscious hearing levels, boost the listener's confidence, and motivation. Users listen at night as they are falling asleep and notice results within a few weeks. "Since winning the 2007 Tour of California, the Ultimate Cyclist has become an indispensable part of my training arsenal," says Leipheimer. "It has dramatically improved my focus and confidence. I recommend it to anyone looking to improve their mental game." The CD retails for $34.95 and is only available at www.UltimateSportsPsychology.com. Other CDs in this sports-specific series include The Ultimate Athlete, The Ultimate Triathlete, Ultimate Fitness and Ultimate Sports Recovery.